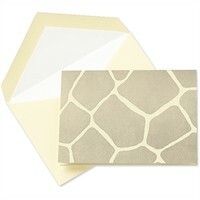 Your message is sure to be noticed when it’s sent on this Giraffe safari-inspired folder. Letter pressed on ecru white for an elegant look and feel, each heavyweight note is blank inside and paired with a white lined envelope. Available in Zebra and Leopard too.